While Ridley Scott's Biblical epic Exodus: Gods & Kings is still in theaters, the hype machine has already been started for the director's next film The Martian, and it's literally out of this world. Empire reports that the December 5th launch of NASA’s Orion Multi-Purpose Crew Vehicle (MPCV), conducted as a 4-hour test flight 5600 miles above the Earth’s surface, had a capsule full of personal objects important to people involved in the project. 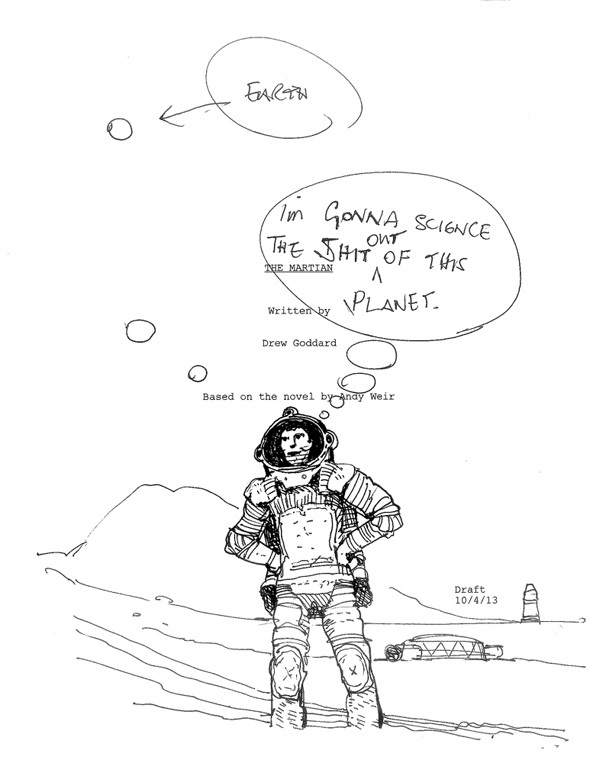 What's cool is that one of the objects was the cover page of the screenplay for The Martian, written by Cabin in the Woods scribe/director Drew Goddard, with a drawing by Scott himself. For those who haven't kept up, the film follows an astronaut (Matt Damon) who is stranded in a colony on Mars and struggles to survive, hoping he can last long enough for NASA to organize a rescue mission. This sounds like an isolated story, but the supporting cast is pretty expansive and impressive with Jessica Chastain, Chiwetel Ejiofor, Jeff Daniels, Sean Bean, Kate Mara, Sebastian Stan and Michael Pena all on board in various capacities. The film is currently in production and 20th Century Fox already has the film set for release next year on November 25th, 2015. Stay tuned for more updates soon. Let's hope we don't see any little green stuff on that planet. Exodus was terrible, Ridley's drawings are cool though. Those "Ridleygrams" are always amazing. I just finished THE MARTIAN. It is really an incredibly fun read. Not about aliens at all. Mainly about survival on Mars and attempting a rescue mission. Thanks for the spoiler warning. Meh...they already talked about it in previous FS posts. Yeah....cause you know all about "effective" spoiler warnings. To be honest, i have disliked most Damon movies over the last years. His appearance in *Spoiler*.................................Interstellar was awful. Whaat? He was in Interstellar?? I was waiting to see that movie!! Your spoiler alert did nothing!!! Nothing!! The book was a very effective comedy/thriller/adventure. I hope the movie measures up. Note to Hollywood - stop making crap. Why not get someone to do any of the Pirx the Pilot stories by Stanislaw Lem. Or might that require an audience to actually have to think?